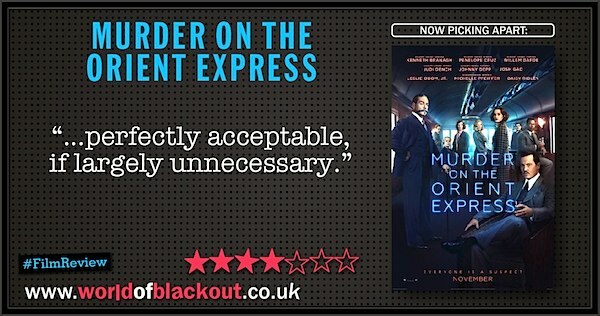 Okay first off, if you haven't seen any version of Murder On The Orient Express before, Kenneth Branagh's new presentation will be ideal for you. Seriously. The performances, sets, costumes, lighting, sound-design and soundtrack are all exquisite, and the photography will tick the boxes for all those whose first reaction to a sunset is to fire up Instagram. While the production certainly never strays far from the precedent set by previous outings, lensmaster Haris Zambarloukos's approach is inherently cinematic. The rest of us, however, spend the best part of two hours asking why another retelling of Agatha Christie's most famous story is necessary; a question which the film fails to convincingly answer. In a bid add a fresh lick of paint to an old carriage, this iteration borrows rather heavy-handedly from other icons of intrigue. 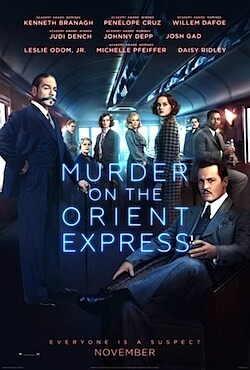 The style of the opening sequence, which sees Hercule Poirot wrapping up his previous case, is a clear nod to the James Bond / Indiana Jones in medias res approach, while our hero's on-the-spot deductions in the first act owe more to Baker Street's most famous resident than even Agatha herself would care to admit. There's the feeling with these inserts that the Belgian sleuth is perhaps being pushed toward a more active cinematic presence, and a couple of sequences later in the film shore up this suspicion, despite feeling uncomfortably out of place themselves. Speaking of incongruities, I'm happy to report than Mr Branagh's moustache and accent combination-set are thankfully nowhere as... awkward as they were in the reveal-trailer*1. Both take some time to get used to, but at least they're not too problematic. Branagh is a fine actor of course, and an even better director. But he's slightly lacklustre as Poirot, somehow. Back at the coalface however, Orient Express itself is the very essence of character-driven storytelling, an approach which is borderline impossible when this many familiar faces are in the room. Harking back to the golden age of ensemble-dramas, the all-star cast is impressive but frankly too big. It's relatively easy to hide one guest star in a movie like this, but here you'll never forget that you're watching Johnny Depp*2 and Kenneth Branagh and Michelle Pfeiffer and Judi Dench and Derek Jacobi and Willem Dafoe and Josh Gad and Daisy Ridley. Despite the tried and tested structure of the oft-adapted tale, the film sags in the middle and never quite regains its pace, even with a thoroughly sincere denouement. "Every day we meet people the world could do without, yet we do not kill them. We must be better than the beasts..."
Oh, and this loses a point for the Death On The Nile setup-line in the final moments. It's cheap, it's cack-handed and it's canonically illiterate*3. Other screen versions of this same story, I shouldn't wonder, or Agatha Christie adaptations in general. Well, it's a testament to the enduring legacy of Christie that a Wednesday evening screening in the second week of its run was over two thirds full (and with a story which, once you know 'whodunnit', you tend not to forget). 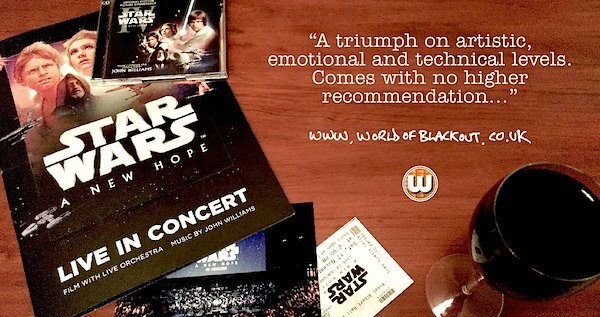 The film's also scheduled to run next week, too, so it's clearly pulling in the punters across the board. Smashing work, folks. Well, ish. The film achieves enough to justify its existence (as a one-off entry, at any rate), but in the grand scheme of things, perhaps the interpretative net should have been thrown wider?. With a cast of this pedigree? Of course not. Level 1: Rey's in this, also there's a 'stepping in poo in a sun-bleached environment' joke three minutes into the film which I'm taking to be a clear homage to The Phantom Menace. *1 Upon viewing the first trailer in the cinema (I'd avoided it at home), it appeared that Poirot's 'new' moustache and windswept hair made him look like he'd been sleeping in a doorway, while the snippets of the accent we heard made it seem like that doorway was somewhere in Gateshead. Mrs Blackout was appalled to the point where she (an ardent fan of Agatha Christie) didn't come to see the film.